I used a 16-inch Robert Tonner doll. 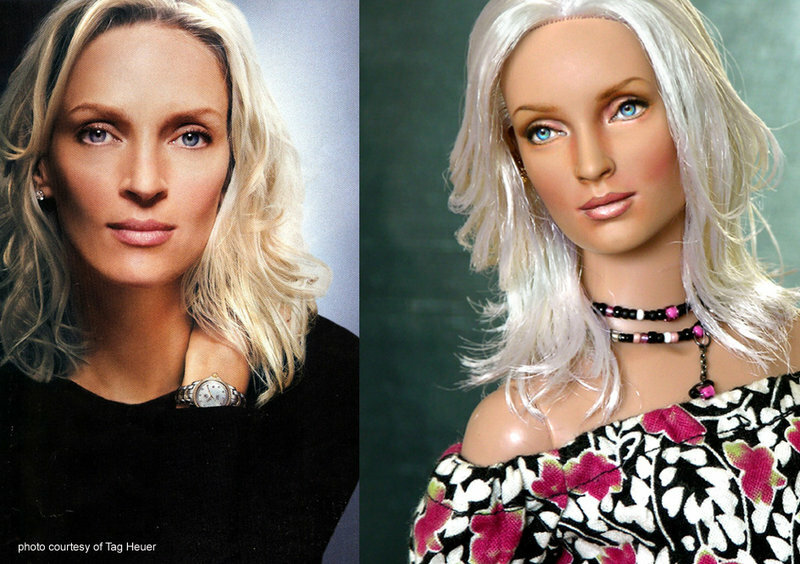 I completely removed factory facial painting and hand painted it to the likeness of the alluring Uma Thurman, as she looked in a recent issue of InStyle magazine Also, the doll's hair started out very curly so I had to cut, perm and restyle it. The photo of Uma Thurman on the left was used as reference for the repaint. Repaint is a new form of pop art, wherein the doll's face is treated like a three dimensional canvas, with the added challenge of painting within a very small area . Since dolls are basically miniature pieces, brush strokes and shading have to be very controlled and precise. this is the first time i see anything like this! thats a big problem with celebrity dolls...they really never look like the real thing! you should work for them! GREAT JOB! i am so fascinated with this. honestly. i can't even FATHOM where you get the patience to do this amazing detail!!! Wow looks just like her! !